Red Sea’s new ReefLED reef aquarium lighting option boasts a highly-tuned spectrum and easy-to-set-up capabilities. After years of research and testing, Red Sea is proud to release the all-new ReefLED™ smart reef lighting system. These lights have been designed to ensure optimal coral growth, dramatic coloration, and a gentle shimmer throughout the aquarium. The ReefLED lights are guaranteed to be Reef-Safe and REEF-SPEC®, and with unique daylight channels they’re also very easy to set up. The built-in WiFi connects them directly to the internet, enabling you to control them from your smartphone using Red Sea’s ReefBeat® smart aquarium app. ReefLED provides the precise intensity and spectrum of light that is actually used by corals. The single compact L.E.D. 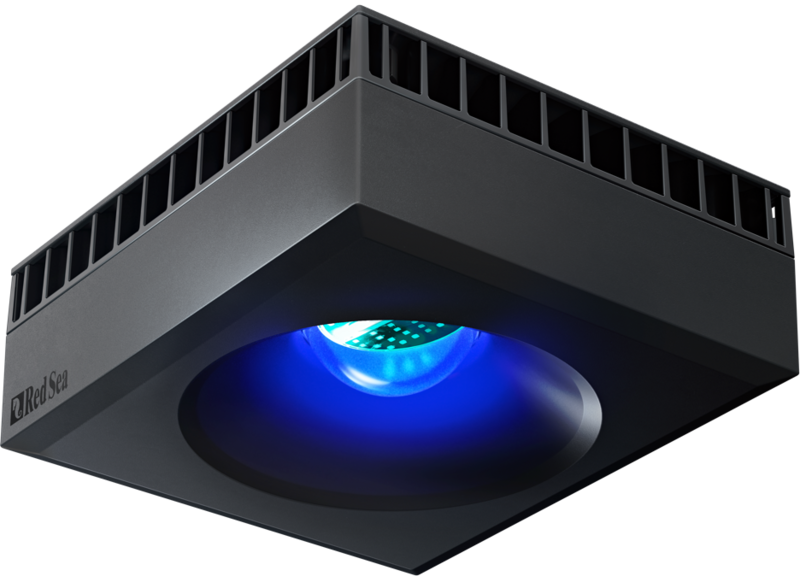 array includes a multi-wavelength “REEF-SPEC Blue” channel (a proprietary blend of blue, violet, and ultraviolet LEDs), which together with an 8,000K White channel provides a reef-safe range of color temperatures that enable all corals to flourish. The ReefBeat app provides a number of preset lighting programs you can choose from, as well as additional features, including sunrise/sunset effects, lunar cycle moonlights, random clouds, and an acclimation program for new installations. ReefBeat also provides best-practice guidelines during setup as well as useful notifications to your smartphone (for example, in the event of a power outage). 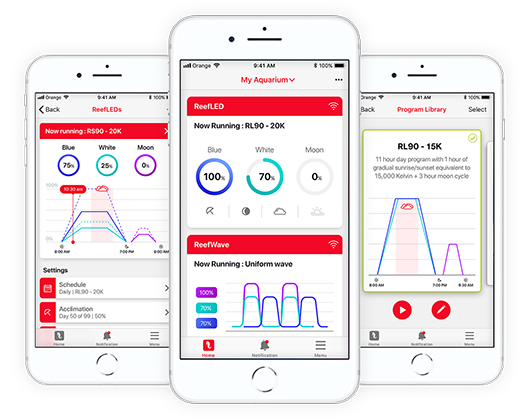 Red Sea’s ReefBeat app boasts one interface for all of Red Sea’s smart devices, easy set-up and operation, and on-line monitoring and notifications. The ReefLED 90 includes 80W of REEF-SPEC Blue, 10W of 8,000 Kelvin White, and 3W of dedicated moonlight and is suitable for aquariums of up to 65cm depth. The ReefLED 50 includes 40W of REEF-SPEC Blue, 10W of 8,000 Kelvin White, and 3W of dedicated moonlight and is suitable for aquariums of up to 50cm depth. To get the full specs, visit our ReefLED product page and see our product video that features corals after two years under the ReefLED 90 lights.